I am not a fan of buying rotisserie chicken (post to come about my reservations) so I cook my own. I have tried numerous recipes in the oven to get a perfect roast chicken. Many home chefs spend a lot of time on the quest for the best roast chicken (me included). Place carrots and onion in the bottom of a 6-quart slow cooker. Mix garlic, thyme and salt in a small bowl. Rinse chicken, pat dry, and rub garlic mixture over bird. I love whole chicken in the crockpot! Yum! The onions and carrot also keep it up off the bottom as well. I do a similar recipe with 6-8 hours on low and it works out fine. The goal is to have the meat coming off the bone. Yes Lisa, whole chickens cooked in a crock taste fine, but look SO lacking. off" if we received one of these pots as a gift. (I called it off, anyway!) I wish my mother had lived long enough to experience some of the wonderful dishes that have evolved in crock cooking! To get a product closer to rotisserie style place the whole chicken on top of a ring of crumpled aluminum foil. The foil keeps the chicken off the drippings. You can pour off the drippings place in the fridge & later scrape off the fat which rises to the top. I use it for soup or gravy. I usually take the easy way out and get a roasted chicken at Costco. Is there any reason that your chicken recipe would be healthier? Of course, they don't list the calorie count on deli food, so I wonder if that deliciousness is caused by something unhealthy?And how much $$$$ would I save by crockpotting my own chicken? i love the posts with no animals being used. this post is hard to see and read. since there is no good reason to buy, cook or eat animals, could you not be so blatant (cant' think of a better word, but not wanting to be mean) about it? also adding comments at the end of a post, for putting in animals and their byproducts could be on the bottom instead of in being in the post would be appreciated. it is much easier, cheaper and healthier to not have the unnecessary extras, we all get more than we need in quality and quantity by just doing the basics; basics being veges, beans, herbs, spices & the like. I have read that washing chicken simply spreads salmonila etc. We are better off just patting it dry. Opinions anyone? Thanks, Lisa. I appreciate your posts. In regards to the person who does not like to eat animals.......just read the vegan posts. Please be respectful of the Snack Girl and all of us who do eat animals. I am a fan of the Zuni Chicken recipe method for a quick weeknight method - small chicken, high heat, - done in about an hour or so served with a salad. If you have a little more time Thomas Keller's version from AdHoc is good with veggies and has pan drippings for a jus or makings for a pan sauce. Yes I am all about my crock pot! That's great. Rhonda that is great that you choose to not eat animals, but A LOT of us here do and we are all here for recipes and not for the soap box speech. If you don't like meat then SIMPLY LEAVE IT OUT! We don't need your Nose drip commentary on it. It is not required nor desired. Amanda M., I've never cooked Cornish hens, but I regularly pull the meat off of cooked chickens to freeze in smaller portions for soups, casseroles, salads, etc. I also use the rest to make broth/ stock which I also freeze in small portions for recipes. Maybe that would work for you. If I want a tasty roasted chicken I'll just roast one in the oven - so easy, or, even easier for clean-up, throw it on the grill with a touch of seasoning salt and italian seasonings mix. I find in the crock pot it turns out more like a stewed chicken - not as tasty as higher heat, but fine for soups. How long to cook in the oven? I am in AZ and it's hot here already to turn the oven on. 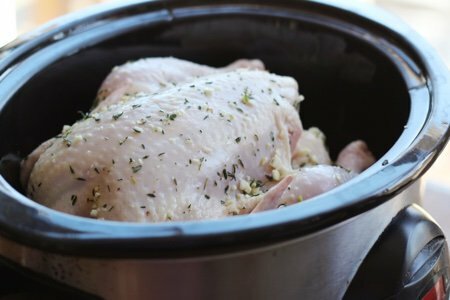 I have done a chicken in the crockpot and it was good but I would like to try it in the oven now and get the skin crispy. I just need to know how long to roast and what temp. Rhonda, I am a long time vegetarian and I understand your sensitivity. But nowhere on here does it claim to be a vegetarian blog. If that is what you want there are plenty out there that will only show the beans and veggies you mentioned. I look to this to read about and get recipes for healthy eating. Not everyone in my family is a vegetarian! I love this idea to roast the chicken in the crockpot. I don't own a crockpot yet but this is another reason to get one. I think I would use this chicken for salads, sandwiches, soups; so many uses and so easy to make. I agree with others who have said to Rhonda that if she doesn't eat meat then skip this post, no reason to be rude on the site. How about re-posting the information about Wonderbag? @ Renee, I don't know how long I cook it - till it's done! I usually do pieces - maybe about 45 minutes at 350 or 375. But I did look up Zuni Chicken that another commenter mentioned; it looks great! Agree with "ring of foil" post above. Except I use 4 little balls of foil under the chicken instead. Also, you don't really want to eat the carrots/onions/whatever, but you can use them again with the chicken carcass to make Crockpot broth. My Crockpot chickens get the meat harvested, then the rest goes right back into the Crockpot for 12 hours with whatever vegetable detritus I have saved up in my freezer (onion skins, carrot/celery ends, etc. ), a splash of vinegar, and enough water to cover it all. Skim the fat and strain and you have a very healthy bone broth that has so many uses and you can freeze for later. Whoa - thanks for the bone broth idea, Inaya! I do all the things previous people mentioned when I roast a whole chicken: chop the surplus cooked meat to freeze for later, make tons of broth, and re-use the vegetables. I've been intrigued by bone broth lately but did not know how (exactly) I was going to make it. You've totally made my day. I'll get out the crockpot. Thanks! Thank you too, Snack Girl. You're great.